17th December 2017 – In a golden career to date it could have been argued that there was one award missing from the glittering CV of Sir Mo Farah (GBR). 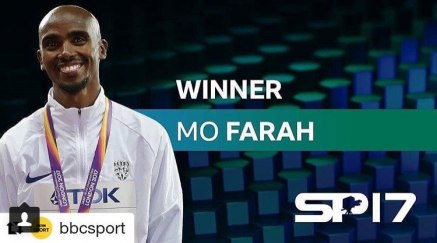 The BBC Sports Personality of the Year is an award voted for by the British public and even though he had been shortlisted five times previously the best Mo had finished was third. However, at the end of this years ceremony in Liverpool’s Echo Arena, the 2017 winner was announced and finally it was to be Mo’s turn.